• The S.A.M. PRO overlay mattress can be used as an effective aid in the prevention and in the treatment of pressure ulcers up to and including category 3(1). • It can also be used as an aid for pain therapy. By using the optional inner cover comfort can be increased while further reducing pressure. 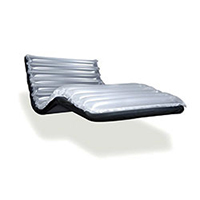 • This static air mattress offers high level of comfort as well as effective pressure(2) redistribution. • With the vastly improved higher maximum weight capacity of 250 kg, this overlay will meet the ever increasing challenges of heavier patients. • The S.A.M. PRO features a new cost effective pump that includes both CPR and Transport functions. • The pump automatically determines when to change pressure in contrast to running constantly. • This makes the pump silent running, vibration free, power efficient and long lasting. • S.A.M. PRO is delivered with a liquid resistant and vapour permeable(3) hygienic cover. • It is a durable cover, which is easy to clean and with a very well documented hygienic standard(4).